After returning to the airport in Gustavus, we flew to King Salmon, the last stop before Brooks Camp. It was another beautiful flight, executed flawlessly by Ron, our pilot. There was one complication after we landed, however. 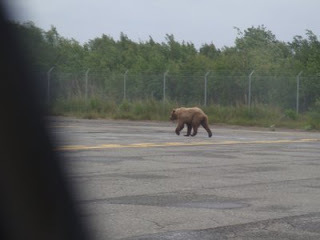 We were greeted by a bear on the runway. We quickly retreated back to the plane and closed the door to wait for our transportation to the hotel. Ron radioed in a report about the bear while it roamed around, in and out of the brush-filled ditch by the runway, and around and behind our plane and another one next to it. Before long a car showed up that followed the bear around for a while. It didn’t seem to be in any hurry to leave the area, so eventually someone opened the gate so it could get out if it chose to do so, and the car left. Our ride showed up while the bear was out of sight and we went on our way. There was one more glitch; when checking the map while we were in Gustavus, Ron realized that the hotel where we had reservations was 200 miles away from the airport. The main hotel in King Salmon had burned down, but we managed to find two rooms in the “old” part of the one remaining. It was a bit short on amenities, but again, we had electricity and hot water, and the manager even let us use the hotel’s laundry to wash our clothes. The next order of business was to find dinner. We asked the manager where we could go to eat. She gestured to indicate that we could go one direction to one place, or we could go the other way to a very good pizza place. We decided to try the pizza place and called a taxi. We neglected to ask how far in that direction we had to go. After about 20 minutes the taxi arrived and we headed off. The car had multiple cracks in the windshield (due to gravel roads and no repair facilities? ), and the window on my side seemed to be held in with duct tape. The driver was recounting his life story as he drove, including how the Veteran’s Administration regularly sent a plane to take him to the hospital for his mental evaluations. He talked and he drove, and drove, and drove—and drove. Finally we came to a building where he stopped and said that the restaurant was upstairs. The bill for the ride was $76.00, one way, not including the tip. We went upstairs and through a bar to a beer-bottles-on-the-table sort of place. Ron and Pat ordered a pizza. It cost $30.00, but it did indeed look delicious. I had a chicken Caesar salad and Dean had a steak. By the time we got back to the hotel, our trip had set us back about $300. 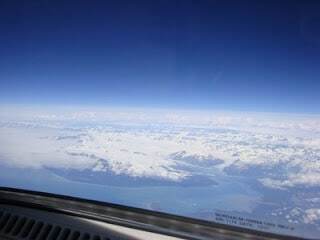 Alaska, Private jet trip, very expensive pizza. Bookmark. Yikes! Now you have a story that’s priceless, though, right? Sorry, I couldn’t resist!